Vegetables don't come easy to me. They are the hardest foods for me to incorporate into my diet. One of the reasons is that they need to be prepped, and then cooked (carrots, celery, and salad ingredients notwithstanding). But the biggest reason is that I grew up eating vegetables out of frozen boxes or cans. Not that there is anything wrong with that, especially the frozen vegetables. It is just that, except for salt, we really did eat them out of the can or the box. Occasionally my Mom would doctor up some spinach with minced onions and cottage cheese (don't knock it until you've tried it), but most of the time our vegetables were naked and overcooked. No butter, no pepper, no garlic, no onion, no nothing. My workaround is to add as many vegetables as possible into my main dishes. I cram them into soups, stews, frittatas, and braises. Onions and garlic are the base of almost everything I make, and tomatoes figure heavily into the rotation as well. Carrots and celery are a close second, and squash, fennel, eggplant, potatoes, rutabaga, zucchini and the occasional cauliflower find their way into much of what I cook. In the summer I do better because of all of the fresh vegetables available at the Green Market. But when I am not making soups or stews, I find myself challenged to find ways to prepare vegetables that don't load them up with butter. They are tasty that way, for sure, but it kind of takes away some of the benefit that they provide. I tell myself that it is better than not eating them at all, but I am not really fooling myself. I have made it a goal for the year to master the art of cooking vegetables in a way that makes them shine, but not because of butter. I eat plenty of beans and grains, and I get more than enough fruit, but I need to eat my vegetables. This bok choy stir-fry is my first effort, and I am quite pleased with how it turned out. 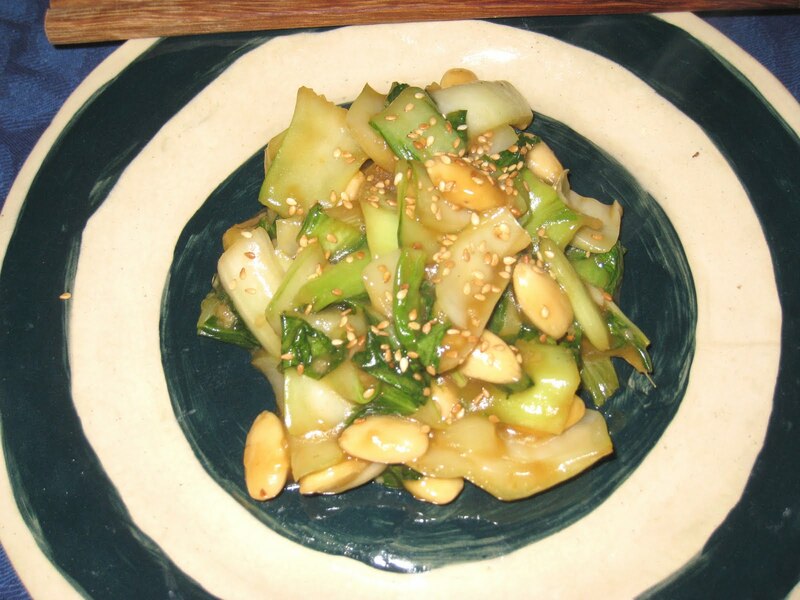 I reached a turning point with stir-fry when I made this zucchini with cashews dish, and I now approach stir fries with much more confidence. I am no longer afraid that everything will burn if I leave it for a few seconds, which has made it a much more calming thing to cook. After spending a few minutes on prep, the actual stir-fry took less than 10 minutes. And clean-up is a snap - all you have to do is wipe out the wok with a paper towel (although in all honesty, I must confess that I usually have to rinse it with warm water since I do not clean it right away). No soap required. Combine the orange juice, soy sauce, rice vinegar and sherry in a small bowl and set aside. In an even smaller bowl, combine the corn starch and water and stir it together, then set it aside as well. the wok continuously so that it does not burn. After about half a minute, add the bok choy stems, continuing to move everything around the wok. After about a minute, pour water around the edges of the pan to create steam and to loosen up any of the garlic and ginger that might have gotten stuck to the bottom of the wok. long enough for them get hot. Add the orange juice mixture and stir until it starts to bubble, then add the cornstarch mixture. Continue to stir until the mixture has thickened, then remove from the heat. Add the sesame oil immediately. Garnish with sesame seeds before serving. Wow! This looks very interesting to try. I would really like to know what is the taste of this dish. I'm also interested to know if what is the effect of the almonds on that dish. Anyway, thanks for sharing this. Please keep on sharing!